Chicago events September 2019. Things to do in Chicago. Chicago Jazz Festival is a free event held in Millennium Park (see a list of what you can bring). North Coast Music Festival is an all-ages music fest that ranges from hip-hop to electronic to indie rock at Northerly Island on Labor Day weekend. African Festival of the Arts celebrates African art, crafts, drumming, food, and entertainment “in a simulated African village” at Washington Park. Cost. Taste of Polonia has 30 bands on four stages, food (polska kielbasa, potato pancakes, pierogi, and beer), vendors, and carnival rides in Jefferson Park. Septemberfest includes an arts & crafts show, a carnival, lots of live music, a beer & wine tent, the Taste of Schaumburg (Sat. & Sun. ), fireworks (Sun. or if rain Mon. ), and a parade (Mon. 10 a.m. on Summit Drive) at Robert O. Atcher Municipal Center. No pets. Free. Naperville Last Fling is a family event with carnival rides, a children’s area, entertainment, evening concerts, food vendors, and a Labor Day parade (Monday 10 a.m.) at Naperville’s Riverwalk Park. Watch knights joust, shop in an artisan market, mingle with costumed minstrels, play games, and attend shows at Bristol Renaissance Faire in 16th century England (also known as Kenosha, WI). Open weekends and Labor Day, September 2, 2019. Head to the Sandwich Fair for carnival games, fair food, grandstand shows, and farm animals. Sample more than 300 wines at the outdoor Windy City Wine Festival near Buckingham Fountain. Chicago German-American Oktoberfest has German music, culture, beer, and food at Lincoln Square (Western Avenue & Leland Avenue). The Von Steuben Parade is Saturday at 2 p.m. Free. Thousands attend Festival de La Villita for authentic Mexican cuisine, music, artisans, carnival rides, and family entertainment at 26th Street and Kostner Avenue. Free. Hear retro tunes at Throwback Music Fest, which also offers arts & crafts, kids’ activities, beverage tents, and classic cars (Sun. 2 to 6 p.m.) in Gladstone Park (Milwaukee Avenue & Peterson). Donation $5. Noir City screens classic films that are stylish, cynical, and melodramatic at the Music Box Theatre. Hear live music, eat great food, visit the beverage tent, and enjoy children’s activities at Ribfest at 7824 Madison Street in Forest Park. Free admission. Taste 50 beers or wines with hors d’oeuvres outdoors, and bid in the silent auction indoors during Stems and Steins at Norwood Park Historical Society for age 21+. Bring your own chairs to watch planes on the ground and in the air at Northern Illinois Airshow, with food and non-alcoholic drinks for sale. Wear sunscreen. No pets. Children age 12 and younger are free. Shop from hundreds of artisans and chefs at the Renegade Craft Fair in Wicker Park on Division Street (from Ashland to Damen). Free. Ukrainian Village Fest offers folk dancers, music, food (potato pancakes, borsch, pierogi, kabobs, blintzes), beer, wine, and a kids’ area on Superior Street (from Oakley to Leavitt). Chicago Bourbon & Barbecue Fest features two music stages, nine barbecue kitchens, a bourbon tasting pavilion, and vendor booths filling the streets at Damen Avenue & Roscoe Street. Donation $5. The Fine Art Festival features art, artists in action, and music in Oak Brook. Repeats in May. Free. Get a feel for camp life, experience a battle, and enjoy colonial sights and sounds at the Revolutionary War Reenactment at Cantigny Park in Wheaton. Free except parking. Celebrate Mexico’s separation from Spain at these Mexican Independence Day parades, with colorful floats, mariachi bands, and street dancing. Free. ZooRunRun includes a timed 5K and a 1-mile kids’ dash entirely within Brookfield Zoo. Enjoy food, crafts, and entertainment from Northern Europe at Scandinavian Day Festival in South Elgin at beautiful Vasa Park. Children age 12 and younger free. Bring sunscreen and a chair or blanket to DeKalb Kite Fest to watch giant inflatable kites, dancing kites, and fighting kites, with free kite making and a candy drop for kids, plus kites for sale at Lucinda Avenue and Kishwaukee Drive in DeKalb. Free except parking. The Whisky Extravaganza includes unlimited tastes of more than 100 whiskies, culinary pairings, and master classes at the Union League Club for age 21+. A ticket to Wine Riot includes unlimited tastes of hundreds of wines at Revel Fulton Market for age 21+. 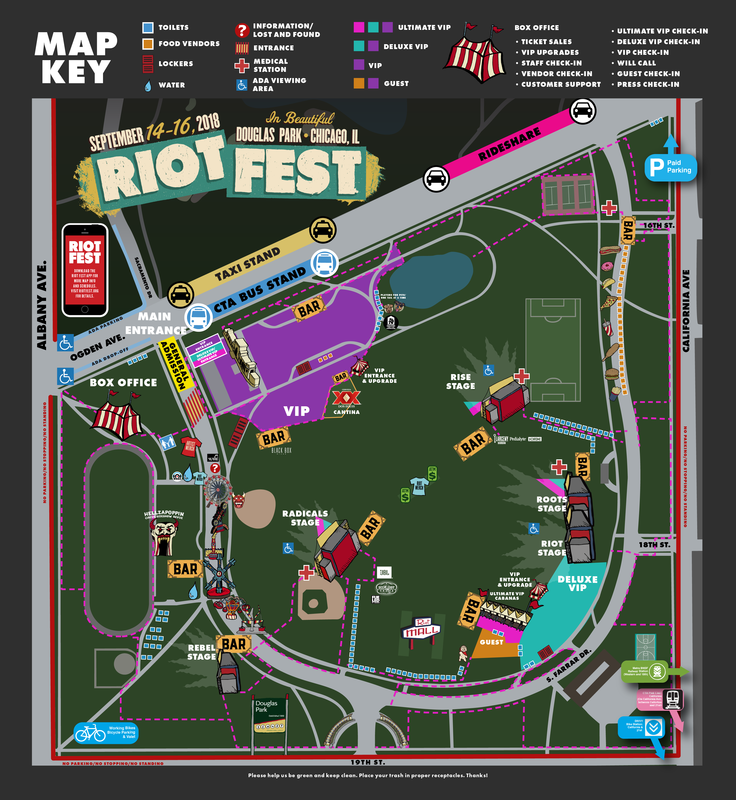 Riot Fest is a huge outdoor punk, rock, and alternative music festival on multiple stages at Douglas Park for all ages. See the event map for food vendors, bars, and carnival rides. Gates open at 11 a.m. Read the FAQ about allowed items. World Music Festival Chicago features artists and ensembles from all over the world. No shows on Monday & Tuesday. Free. The inaugural Printer’s Row Art Fest is near Printer’s Row Park on Dearborn Street (from Polk to Harrison). Free. Experience authentic Japanese festival food, beverages (tea, beer, sake), and cultural performances (Taiko drumming, calligraphy, martial arts, ink painting) at Chicago Japanese Matsuri in the plaza of NewCity at 1457 N. Halsted Street. Meet 150 juried artists selling paintings, sculpture, photography, furniture, and jewelry at Lakeview East Festival of the Arts, visit the kids’ area, and hear music on two stages at Belmont Avenue & North Broadway. Donation. See 600 classics ranging from muscle cars to rare imports at The Classic Auto Show, with celebrity talks and 200 vendors in the Rosemont convention center. The International Exposition of Contemporary & Modern Art (Expo Chicago) has museum-quality curated art and design by 135 exhibitors at Navy Pier. Manteno Oktoberfest has a beer tent, food, a carnival, live music, a garage sale (Fri. to Sun. ), a pet parade (Fri. 6 p.m.), and a lighted parade (Sat. 6:30 p.m.). Free. Reeling is Chicago’s LGBTQ International Film Festival. Enjoy live music, craft beer, wine, local restaurant food, and a kids’ root beer garden (Sat. noon to 5 p.m.) at Oaktoberfest in Oak Park. Bring cash. Free. See 140 artisans exhibiting one-of-a-kind museum quality work at American Craft Exposition at Chicago Botanic Garden. Rocktoberfest delivers rock bands, beer, bratwurst, and a kids’ area in downtown Plainfield. Fall Arts & Crafts Adventure is a friendly juried show at Hodges Park in Park Ridge. Repeats in May. Free. Try tacos from a dozen restaurants and vote for the best, drink beer, hear live music on two stages, visit the kids’ area, and watch Mexican wrestlers at Lakeview Taco Fest on Southport Avenue (from Addison to Roscoe). Donation $10. Chicago Food Truck Fest brings 25 food trucks, music, a sangria garden, and games to LaBagh Woods. North Shore Festival of Art features juried artists, live music, art projects for kids, and wine tasting outdoors at Westfield Old Orchard Mall in Skokie. Free. Riverwalk Fine Art Fair is a juried fair with 140 artists at a scenic park in downtown Naperville. Free. Gather in Daley Plaza to hear live music, listen to speakers, and watch a ceremony calling out the name of every country with its flag on Peace Day. Free. Buy tickets for one of the routes, and then get samples from restaurants along the way during Fall Dinner Crawl in Wicker Park and Bucktown. See the winning films from Chicago 48 Hour Film Project, which locals made in only two days, at Music Box Theatre. Eat gourmet burgers with beer, wine, and spirits when top chefs compete at the $145 Hamburger Hop on the rooftop of Harris Theater, followed at 9 p.m. by a $59 Late Night Gourmet After Party. Both events age 21+. West Town Art Walk includes visual art, music, and fashion in restaurants and shops along W. Chicago Avenue (from N. Milwaukee Ave. to N. Western Ave.). Free. Chicago Gourmet offers premium food and wine events, with the main weekend events showcasing hundreds of restaurant chefs, vintners, and breweries in Millennium Park. Enjoy beer, bratwurst, pretzels, live music, and arts & crafts at Oktoberfest at St. Alphonsus Church for $10 donation ($5 Sunday). Ticketed craft beer tasting in the church Fri. & Sat. (6 to 9 p.m.). Beer in the Woods features tastings from 30 breweries and cideries, live animal displays, DJ music, birds walks, home brewing demos, local food trucks, and activities for both beer and nature enthusiasts at LaBagh Woods. No dogs. Villa Park Brewfest offers “exceptional beers from local & regional craft breweries as well as tasty food truck cuisine” at Cortesi Veterans Memorial Park, age 21+. Edgewater Arts Festival (formerly Edgewater Fall Art Fair) features 100 local artists, 3 stages of live music, food vendors, and a beer garden on Granville Avenue (from Broadway to Sheridan). Donation. Hear 36 jazz performances by top artists indoors and outdoors at the Hyde Park Jazz Festival. Donation. Oktoberfest at Lynfred Winery includes a pig roast, grape stomping, cork tossing, a lederhosen contest, wine for sale, and crowds. World Dumpling Fest features “delicious dumplings from ethnic restaurants in and around Chicago, interactive craft tables, cultural art vendors, and exciting global music acts” in Polk Brothers Park at Navy Pier. Free admission or buy tasting tickets. A ticket to BeerHoptacular gets you 20 tickets to sample some of the 150 American craft beers, live music, food for sale, and a home-brew competition at Vertiport Chicago for age 21+. The Chicago Half Marathon begins in Jackson Park and goes along scenic Lake Shore Drive. Free to watch. Walk, bike, or drive between houses on the Historic Berwyn’s Bungalow Tour to hear about their history. Midnight Circus in the Parks is a series of shows at nine parks, which is perfect for families. YAS Fest (Youth Arts Showcase) offers a wide range of performances, exhibitions, and hands-on activities at Millennium Park, Chicago Cultural Center (first floor south), and Art Institute of Chicago (modern wing). Free. Baroque in the Park features music by Handel, Mozart, and Vivaldi performed by Music of the Baroque at Jay Pritzker Pavilion in Millennium Park. Free. Spectacular singing and orchestral music await you at Stars of Lyric Opera at Millennium Park, which invites you to pack a picnic. See a list of what you can bring. Free. A $175 ticket to Haute Dog includes cocktails, hors d’oeuvres, a fall fashion show featuring dogs and their owners, a silent auction, a speaker, and a look at canine companion puppies at The Peninsula. No pets. Experience the art, music, dance, and cuisine of Turkey at the free Chicago Turkish Festival at Daley Plaza, 50 W Washington Street. Free entry. Reflections offers lectures, demonstrations, and free entry for seniors and adult chaperones at Art Institute of Chicago, 159 E. Monroe Street. Register online for the optional lunch. Fulton Market Harvest Fest promises “cooking demos, live music, booths from the city’s best restaurants, and family friendly fun” on W. Fulton Market (from Halsted to Peoria). Children age 10 and younger are free. A ticket to the Summer Soirée includes gourmet hors d’oeuvres, a premium open bar, a live band, dancing, and dessert at Shore Club Chicago and supports the Junior League of Chicago. Taste doughnuts; drink mimosas, beer, wine, and coffee; watch entertainment; and visit the animals and gardens during Donut Fest at the Zoo at Lincoln Park Zoo for all ages. Fiesta Familiar features live music, dance, and family-focused activity stations for art, health, gardening, and science at Lincoln Park Zoo. Free. Held underneath the “L” tracks, Lightbash is “an immersive, energetic evening of art, technology and innovation...featuring music, interactive lights, glass-blowing demonstrations, hors d’oeuvres, and an open cocktail bar” outside Ignite Glass Studio. Watch jet skiers compete in seven 30-minute races during P1 Chicago Grand Prix at 31st Street Harbor. Free except parking. Learn how to do the line dance and the two step at the Fall Ball, which begins with lessons and then has open dancing at Duet Dance Studio for age 21+. You can bring your own beverage, with or without alcohol. A ticket to Lakeview East Wine & Sweets Stroll includes a glass, wine samples, and sweet bites in 12 neighborhood shops for age 21+. A ticket to Shortcut 100 International Film Festival includes a reception followed by 11 “quality independent short films” at The Logan Theatre. Visit 300 artists in tents and shops along Ravenswood Avenue during Ravenswood ArtWalk. Nearby, RAW Street Fest has music stages, food trucks, a beer garden, artists, and kids’ activities. Donation. Andersonville Arts Week includes Friday evening receptions in galleries and shops on Clark Street, in addition to art walks, performances, markets, and a closing party. Show Illinois ID to enter the Museum of Science and Industry free during Free Days. The museum is not free on Fridays, Saturdays, or Sundays. County Fair Chicago promises music (bluegrass, rockabilly, and country jams), food vendors, and craft & cooking competitions at 4901 W. Irving Park Road. Children younger than age 12 are free. Englewood Jazz Festival features 7 performances plus awards in Hamilton Park (auditorium if it rains). Free. The 79th Street Renaissance Festival in Auburn Gresham is a community festival with entertainment, food vendors, a marketplace, and a kids’ corner on 79th Street (from Racine to Loomis). Free. St. Joseph Oktoberfest has an antiques market, kids’ games and rides (if you buy tickets), German food, a beer garden, and live music in Wilmette. Free. The Monarch Butterfly Festival has a butterfly tent, live animals, an arts & crafts fair, children’s activities, and food vendors at Lake Katherine Nature Center in Palos Heights. Elim Dutch Festival features Dutch food, dance, music, and vendors, plus a kids’ carnival, petting zoo, and train rides at Elim Christian Services in Palos Heights. Free admission. Lisle Ale Fest has 80 American craft beers (including Oktoberfest and pumpkin), live music, and local food for age 21+. No pets. Glendale Heights Oktoberfest promises good music, a great beer selection, authentic German food, and friendly service at Camera Park in Glendale Heights. Experience Native American culture through dance, drumming, art, and storytelling at the Harvest Pow Wow, which also has food booths, crafts for sale, and a kids’ corner at Naper Settlement. A ticket to Burritos & Bach includes a burrito bowl/wrap, a churro sundae, and two beverages (alcoholic or non-alcoholic), with a cash bar available as The Elgin Symphony Chamber Ensemble performs works by Bach at Sears Centre Arena. Enjoy Lebanese food, beer, wine, music, folk dancing, belly dancing, and kids’ activities at the Lebanese Festival at Our Lady of Lebanon Maronite Catholic Church in Lombard. Children younger than age 10 are free.